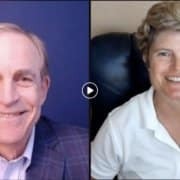 Jim Dodson — the attorney known as the Florida Bike Guy — conducted a 45-minute interview yesterday with CyclingSavvy coFounder Keri Caffrey. It’s outstanding! As you watch, I promise light bulbs will pop on and you’ll be saying “yes” throughout. You can watch the public Facebook Live interview, or the Youtube video embedded below. The presentation features eye-opening graphics interspersed throughout. Essential viewing for everyone who uses our public roads. I hope you’ll share this with everyone you know. 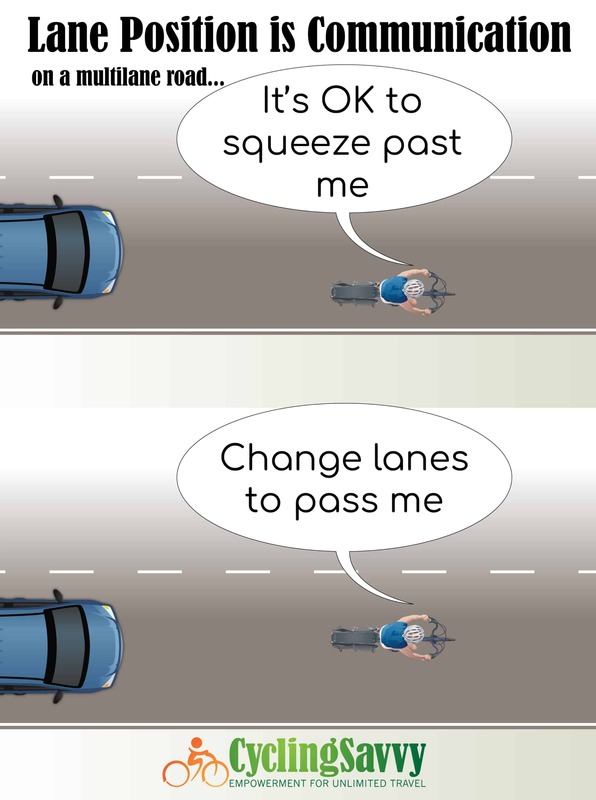 Do you know the safest lane position?? It’s probably not what you think. Find out the truth about the safest lane position by watching our interview with the co-founder of CyclingSavvy, Keri Caffrey. Keri provides valuable safety tips so you will not want to miss this one! That’s all. It’s not hard. While driving is often mundane, even boring, anything unusual can happen at any time. An errant motorist can cut across your path. A child can dart into the road. 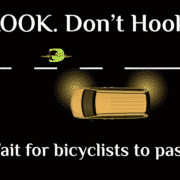 A bicyclist, or motorcyclist, could swerve to avoid something you can’t see. It is the responsibility of every driver to be present — in anticipation of the unusual — ALL the time. It only takes one person to avoid a crash. Driving home to St. Louis last November from an ABEA board retreat in Louisville, I got a speeding ticket. I earned it, fair and square. I believe in taking responsibility for my actions. If I got caught speeding again, I believe I deserve to lose my right to drive my deadly weapon for a specified period of time. OK, so why I am telling you this? I am dog-on-a-bone-DONE with people not taking responsibility for their actions on our public roadways. I’m ready to ban the word “accident” from our vocabulary when we talk about crashes that maim and kill people. I want it to be UNTHINKABLE to hit what’s in front of you with your vehicle. Safe transport on our public roads is a precious liberty. Let’s update our traffic laws to ensure this liberty for all. I resolve to make our public right-of-way safe for each of us. 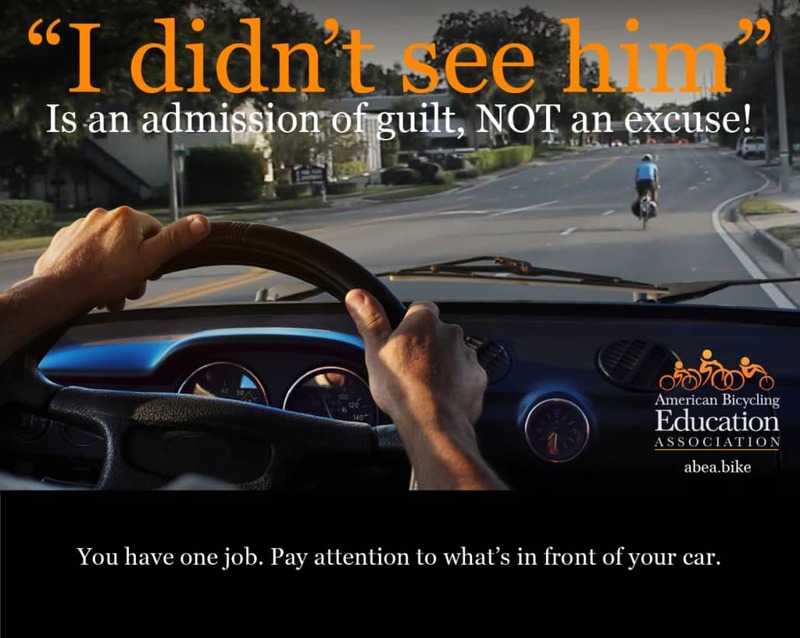 I start by taking responsibility for how I show up on the roadway, in my car, on my bike, or on foot. Will you join me? 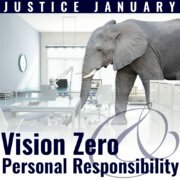 Have you heard of Vision Zero? It’s a worthy initiative that many of our city and state governments have embraced. I want to be a part of it. I don’t have to be perfect, but I do have to take 100 percent responsibility for my actions. Safe transport on our public right-of-way is a precious liberty. Let’s update our traffic laws to ensure this liberty for all. “You may use today as a grace period to drive your vehicle home or to another secure place. “But because this is your second moving violation, you MAY NOT drive any motor vehicle for the next 60 days, starting tomorrow. “If you’re caught doing so, penalties are steep. The officer could suggest options for getting around without a car — including an excellent program where people discover how to easily use their bikes for transportation. Because bicycle transportation is normal. How can we stop negligent driving? We can start with ourselves. Speeding is an infraction that most people do every time they drive. We get away with it, so it becomes normal. Most people — even those who consider themselves safe drivers — feel entitled to drive above the speed limit. Evading detection is the primary concern, not safety, sight lines and reaction times. Another infraction that is increasingly common is inattention — this ranges from the mundane fiddling with a radio or GPS, to the outrageous behavior like texting or checking Facebook. Again, most people get away with it, so they continue to do it. It makes us unwilling to insist that driving is a privilege to be earned and maintained only through responsible behavior. That needs to change, or there will be no Vision Zero. People who routinely practice grotesquely negligent behavior on our roads almost always give warnings before they do something truly tragic. There is often a trail of traffic violations. In the 21st Century we understand cause and effect on our public roadways. This whole “There But For the Grace of God Go I” thinking has got to stop. Will you join me in taking responsibility for your behavior? 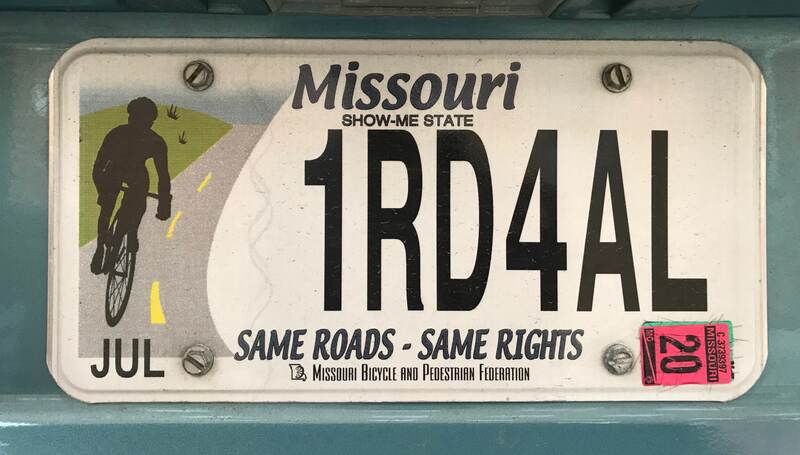 If you won’t, you don’t deserve the privilege of having a driver’s license. We’ll change our traffic culture by changing ourselves first. I take responsibility for my behavior. You do, too, right? Yay, and thank you! Now let’s change the culture. Safe passage is a basic right. I’m dog-on-a-bone-ready to ensure safe passage for each of us, however we convey ourselves. What do we do next? Please share your ideas in the comments. If you would like to write a post on the topic of traffic justice, please let us know. When I was a hot-shot, I wanted to be the next Greg LeMond (I know, I’m dating myself). I stripped every nonessential gram from my Italian racing steed, so I could go that much faster. I actually looked into how I could inflate my razor-thin tires with helium, so I could shave off another fraction-of-a-fraction-of-an-ounce. A mirror on my helmet? Pfff. I was too cool to even wear a helmet, let alone put a dorky mirror on it. None of the professional cyclists I idolized even wore helmets, let alone helmet mirrors. And I was practically one of them. …I didn’t need a mirror on the helmet I didn’t wear. My ears told me the make, model, year, closing speed, and passing clearance of whatever was behind me. Oh, yeah, my ears knew the color of the vehicle behind me, too. Amazing! What can I say? I was an over-confident teenage boy with an overabundance of derring-do — and a decided lack of humility. Yes, I could hear an approaching vehicle, and even be able to guess pretty accurately whether it was a sedan or a semi. But that’s nothing special if you have average hearing, which mine most assuredly is. Ask my wife. …if all you ever do is hug the edge of the road (and pray for your life as you hear a roaring engine barrel toward you). Your hearing might be all you ever need if you never leave the edge to make a turn, change lanes, or avoid a hazard. Or if you don’t mind getting your legs shaved by the land rocket that just buzzed you. If you’d like more space, read on. When you choose to ride on the edge, you’re irrelevant. 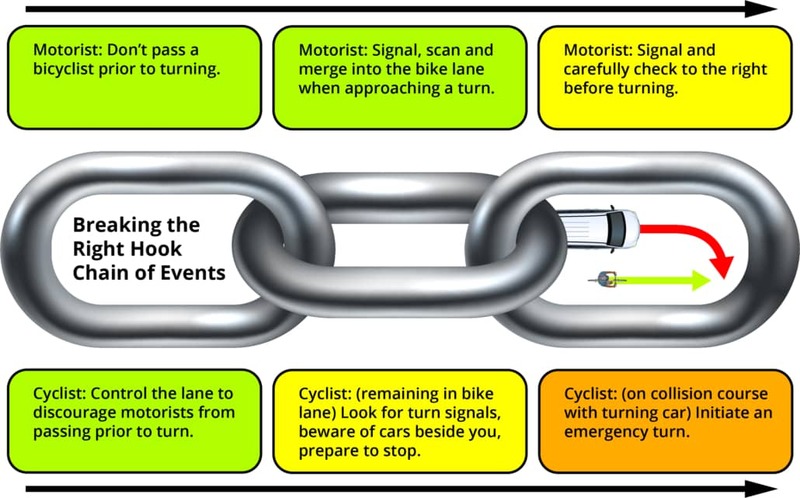 This is one of the most important things I learned when I encountered CyclingSavvy. 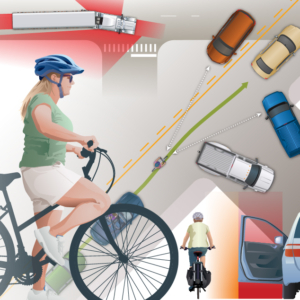 The more relevant you are to motorists, the more you influence their choices. Where are you more relevant? Somewhere away from the edge. Every time you glance over your shoulder, you take your focus away from where it’s most needed: In front of you. The exact location away from the edge depends. That’s the next thing I learned from CyclingSavvy: How to think critically about the road and the traffic on it. How wide is the lane? Can I safely share it with a car? An F-150? A semi? How heavy is traffic? How fast? What conflicts am I vulnerable to? How can I reduce my risk? 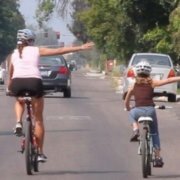 What’s my cycling behavior communicating to others? It’s OK to ride far to the right, if many conditions are met. Can you see the car behind me? I can, too! Often, though, it’s not OK. It’s more dangerous to be on the edge than in the lane of traffic. 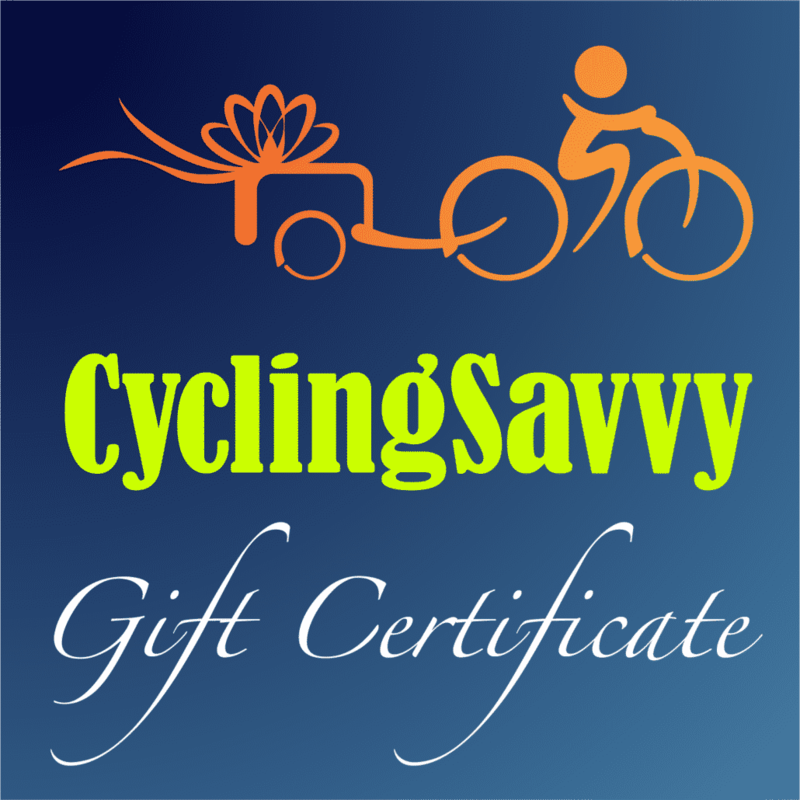 With savvy cycling know-how, I learned how to tell where I should drive — yes, drive — my bicycle. This is CyclingSavvy’s other big takeaway: Cyclists who adopt driving behavior — rather than edge behavior — are more visible, less prone to conflict, and more relevant to others on the road. They also get where they’re going faster and more directly. Oh, and they have more fun. What does this have to do with bicycle helmet mirrors? Think about it. Do you need mirrors on your car? On your motorcycle? Yes, of course. They’re required by law, and for good reason. 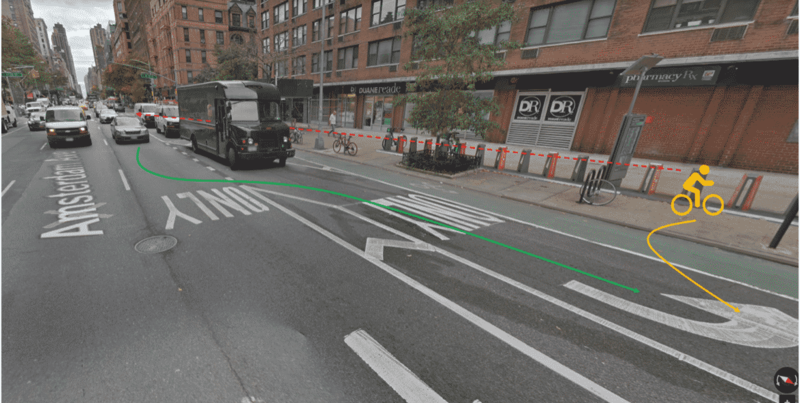 Drivers need to be able to see all around them in order to change lanes and make turns. Bicycle drivers are no different. Unlike car drivers, though, we have a built-in advantage. Because we’re not encased in a steel and glass box, we have much more ability to know what’s going on around us. My teenage self was spot on: you can hear what’s coming from behind you. Seeing what’s behind you is pretty simple, too. Just glance over your shoulder. Here’s the thing, though. Every time you glance over your shoulder, you take your focus away from where it’s most needed: In front of you. Me and my helmet mirrors. Yes, mirrors. I love — and I mean capital “L” LOVE — my helmet mirrors. Yeah, that’s plural. I have one on my left, and one on my right. I often need to change lanes to the right. A mirror on the right gives me a quick check of what’s behind me on my right. With mirrors, I keep my focus in front of me more of the time because I can just move my eyeballs instead of having to move my whole head — or in my case, my whole upper body, since I’m not quite as limber as I used to be. Whether you use a mirror or not, ALWAYS look over your shoulder before making a lateral move. By taking a quick look in my mirrors, I get a preview of what’s going on behind me. 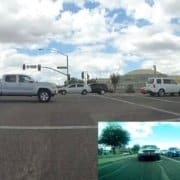 I can read the behavior of the drivers behind me and see in real time how they’re responding to me. Note that I used the word preview. Before changing lanes or lane position, I always look over my shoulder as well. I’ll say that again. It’s super important. Whether you use a mirror or not, ALWAYS look over your shoulder. Turn your head or torso to see what’s behind you before you change lanes or lane position. A mirror can be helpful, but it’s not a good substitute for a head turn. Why should you look over your shoulder if you have a mirror? “A mirror can be helpful, but it’s not a good substitute for a head turn,” said CyclingSavvy co-founder Keri Caffrey. 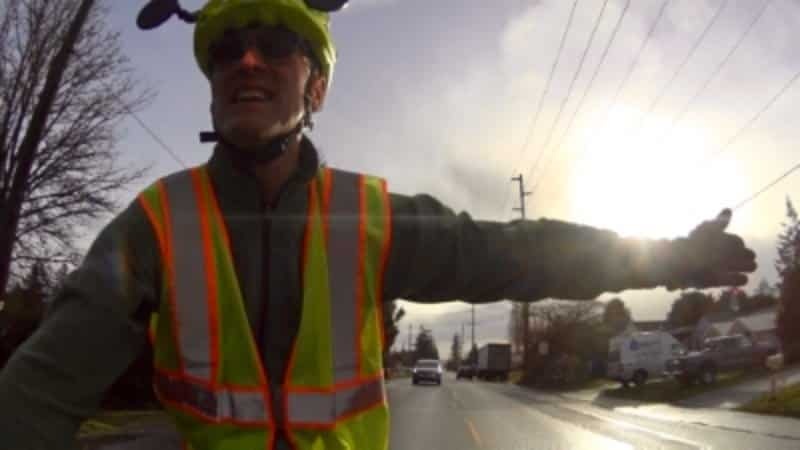 During the parking lot skills session, CyclingSavvy instructors work extensively with their students on “Shoulder Check.” Being able to look over your shoulder while keeping a straight line does several things: It helps you check for traffic. It establishes your humanity and allows you to communicate with others. Also, you don’t want to “wobble” when you’re out and about (and we show you how not to). Riding straight is important for predictability and respect from others. “A good head turn is a tool for getting drivers to notice that you want to do something,” Keri said. It’s a skill that doesn’t come naturally, even for bicycle safety experts. “I didn’t develop a good shoulder check until I rode without a mirror for several months,” Keri said. CyclingSavvy taught me that I have a right to use the road, and that cowering on the edge doesn’t do me or anybody any good. But in addition to that, I learned how to claim my rightful road space and cooperate with other drivers as I control my space. This is the essence of Control & Release. With helmet mirrors, it’s a lot easier. Here’s how: Let’s say I’m riding down Perry Avenue near my home. Like most roads around here, it’s a 2-lane road with 11-foot lanes, too narrow to share. There’s no way I’m going to “get out of the way” and “share” a lane with that 10-ton behemoth, so I calmly give everyone The Hand. 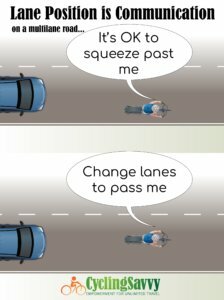 I make myself relevant by riding in the middle of the lane, so it’s obvious to drivers who want to overtake me that they’ll need to change lanes to pass. This is the passive communication that our lane position always gives. As I ride along, I glance at my mirror and see a car approaching me quickly. I glance again, and see that the driver has slowed down. She’s hanging back, patiently waiting for a safe opportunity to pass. I wave to Monster Truck and don’t get a return wave. That’s OK. I got what I wanted, which was my space. “Motorist Eternity” — also known as Must Pass Bicyclist Syndrome — happens when a motorist finds him- or herself “stuck” behind a bicyclist. 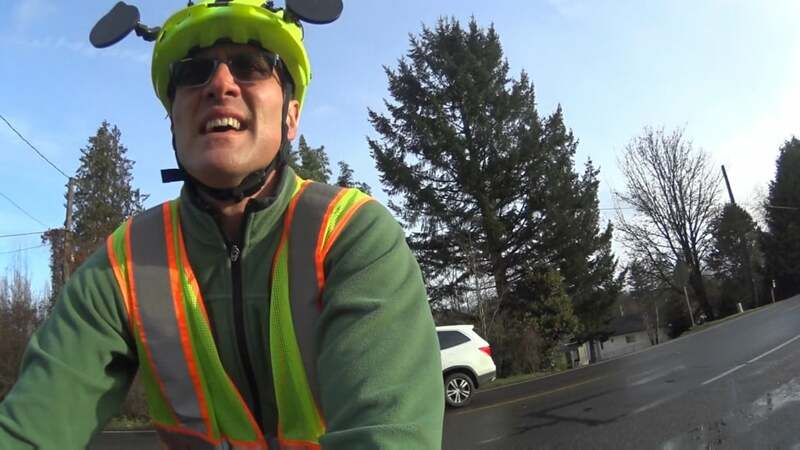 Motorist Eternity can kick in as early as five seconds of being “stuck” behind the bicyclist. The nice lady’s patience is starting to wane. But it’s the driver of the monster truck who I’m really thinking about. Sure enough, at Second 31, Monster Truck starts scooching over to pass both of us, even though there’s an oncoming car. I just hold my hand there and glance in my mirror again. “The Hand” is the universal hand signal for “stay back,” left arm extended diagonally out, palm back. Sure enough, Monster Truck moves back into the lane. That driver is not happy, but gave me what I wanted, because I asked. I knew to ask because I could read their behavior in real time by looking in my mirror. Passive communication with my lane position wasn’t enough. I needed active communication too. 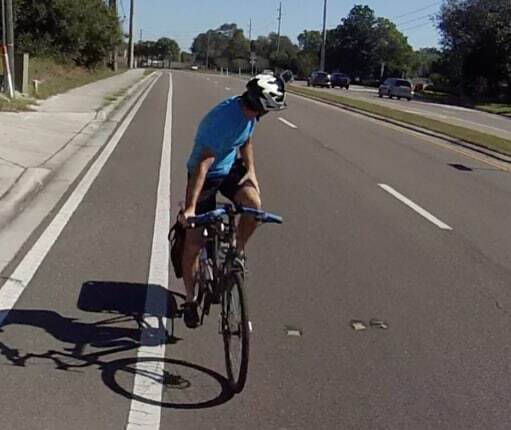 Fortunately, there’s a usable shoulder coming up, so I retract The Hand, and give a right-turn hand signal as I maintain lane control. When the shoulder opens up, I look over my right shoulder, move to the right, stop pedaling, and give everyone the Come Along Wave, left hand making a circular motion in a “come along” kinda way. As the nice lady starts to pass me, I now give her the Thank You Wave. She waves back! I wave to Monster Truck, too, and don’t get a return wave. That’s OK. I got what I really wanted, which was my space. After Monster Truck passes, I glance in my mirror again, see nobody behind me, do a shoulder check, give a left-turn hand signal, do another shoulder check (since my arm is already out anyway), and move left into the middle of the lane. Those dorky helmet mirrors give me the awareness I need to be able to mix and mingle with traffic in a fluid, harmonious way. In all of this, the mirror allowed me to see how drivers were responding to me without me taking my focus away from where I was going. My mirrors also gave me a first glimpse prior to my shoulder checks as I prepared to make lane position changes. It’s certainly possible to do Control & Release without using mirrors. It’s just that without a mirror, you’ll spend an awful lotta time looking over your shoulder…over and over…each time you want to see what’s happening back there. No fun! 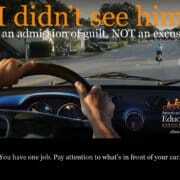 Act like a driver to be treated like one. The more relevant you make yourself, the more you are respected. Using “driver behavior” makes it easier to see what’s happening around you, so you’re able to respond more quickly to dynamic situations. Why every ride is a joyride. My mirrors are key to my safety and success on my bike. It’s why every ride is a joyride. 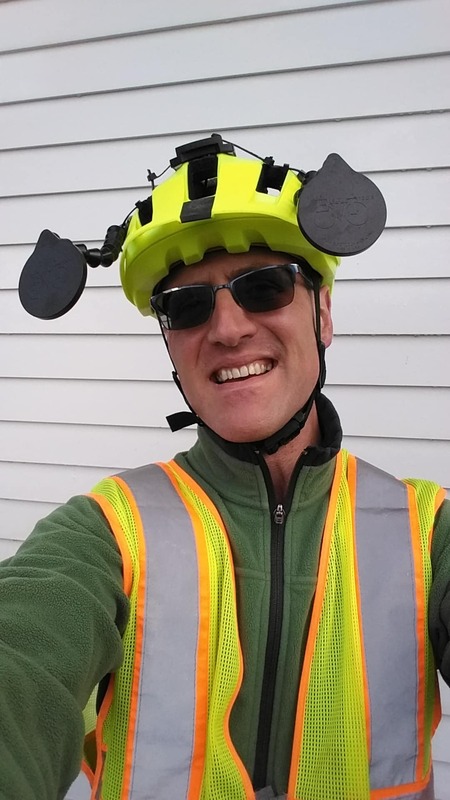 Because, yes, those dorky mirrors on my helmet give me the awareness I need to be able to mix and mingle with traffic in a harmonious, responsive way. My bike is no longer a stripped-down thoroughbred. I always wear a helmet now. My younger self would be embarrassed to be seen with me. But if I had the chance to take my younger, sportier self out for a ride, I think even he’d be impressed with that middle-aged guy with the dorky mirrors, riding with grace and confidence, hardly ever getting buzzed, fluidly cooperating with traffic, glancing back occasionally in his mirrors to see if that young racer know-it-all is keeping up. Now through December 31, when you donate $40 (or more!) 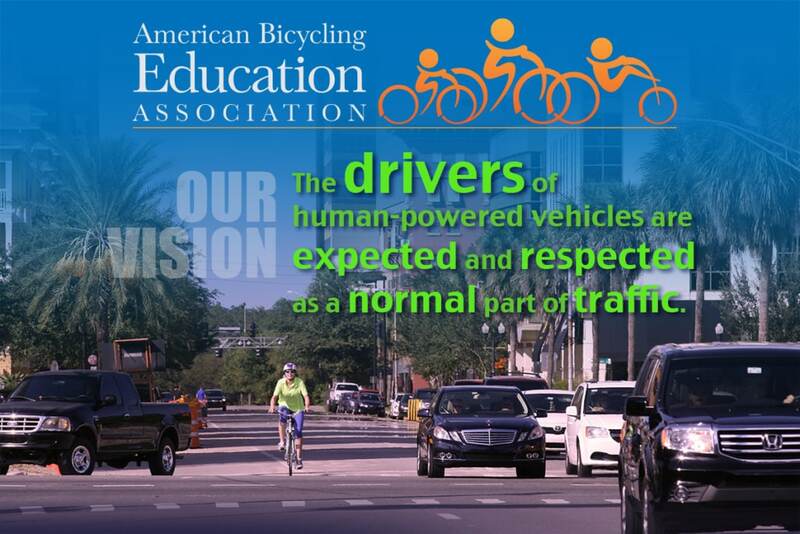 to the American Bicycling Education Association, Brian will say “Thank You” with an EVT Helmet Mirror. That’s right! For the same price you’d pay online for one of these fantastic mirrors, you’ll be helping ABEA spread savvy cycling to more people. “Wearing my EVT Helmet Mirrors are like having eyes in the back of my head,” said Brian, who loves these mirrors so much that he became a dealer. He also suggested this promotion to benefit ABEA. 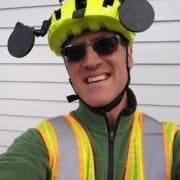 While ABEA makes no specific product endorsements, many instructors join Brian in making good use of EVT helmet mirrors. ABEA also appreciates Brian’s incredible generosity! Make a $40 donation for each mirror you want. Your tax deductible amount is $18 per mirror. The rest covers the cost, shipping and handling of the mirror from Bremerton, WA (USA). Match Brian’s generosity with your own and help “pay it forward” for ABEA. Thank you, Brian! If I can can make it there, I’ll make it anywhere. 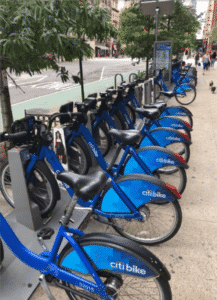 My thoughts exactly as I returned from a four-day vacation in New York City, during which I showed the world that savvy cycling can conquer even the Big Apple. My eyes were drawn to the cyclists. Lots of them. More than I see in other cities. At the start, I had no intention of spending ANY time on a bike. 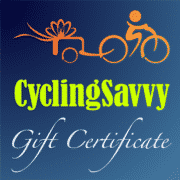 Sure, I’d gained lots of skills and confidence since finding CyclingSavvy. I’ve biked in several big cities. All those four- and six-lane avenues and cross streets? The traffic? In the cab from Penn Station to our hotel on the Upper West Side, my eyes were drawn to the cyclists. Lots of them. More than I see in other cities. I took note of how they rode and saw much of the same behavior I see everywhere. Running red lights, weaving in and out of lanes, going the wrong way, not yielding to pedestrians. Cycling here was just like anywhere else. Maybe I’d give it a shot after all. And show ‘em how to do it right! By Saturday I’d made up my mind to take the plunge. 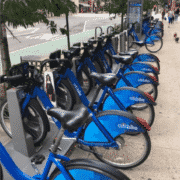 New York has a well-developed bike share system called CitiBike. The phone app makes it easy to purchase one-day passes, find the nearest docking stations and unlock bikes. The price was $12 for a 24-hour pass in which all 30-minute rides are included. If any ride goes over 30 minutes, you’re charged $4 for each additional 15 minutes. No problem, just ride station to station and you avoid the overages. I started out that morning with a bike from a station just outside my hotel — how ’bout those apples? — and headed straight down Broadway to Midtown. I controlled a regular travel lane the whole way. This was no problem because traffic was light — although being NYC, there was still traffic. I ran errands here and there, and just had a blast barreling down the avenues and cross streets. CyclingSavvy etiquette at its finest. At one point while using the middle lane on Broadway, a transit bus in the lane to my right had its left blinker on. I slowed to a crawl, made eye contact with the driver through the bus’s rearview mirror, and motioned the driver to move into the lane ahead of me. CyclingSavvy etiquette at its finest, if I do say so myself. I was vaguely aware that NYC has a mandatory bike lane law, but I stayed in the travel lanes anyway. No law obligates me to endanger myself for another road user’s convenience. That first morning, using regular travel lanes was no problem. Although there are lots of bike lanes in NYC, there are still a lot of big roads without them. At one point while heading downtown, a cyclist who stayed in the bike lane passed me. Like every other NYC cyclist I saw, she rode through red lights and generally didn’t look around or signal. Despite that, I kept up with her until I turned onto 42nd street. So much for the advantage of the bike lane. Some bike lanes are just painted lines on one side of the road, and typically have the dooring problems we know and loathe. My one mistake involved a “protected” bike lane. In New York there are also separated bike lanes that go between the curbs and lines of parked cars. These are worse, because they hide cyclists from drivers. The one mistake I made involved one of these lanes. I had just undocked a bike and was a little careless in getting out onto the road so I could make the next left. I had to cross the separated bike lane and just as I started onto the road, I saw a car coming. I thought this was just the usual plaintive cries of the urban cyclist-hating driver. Crossing this bike lane to get to the left turn lane should have been easy, but the parking island that is deliberately designed to form the “protected” bike lane blocks my view of the approaching traffic, thereby making my entrance harder. But at the next stop light, he explained to me very nicely and calmly that he hadn’t seen me pop onto the street until he was a little too close. I realized he was right and apologized. Crossing that bike lane to get to the left-turn lane should have been easy. But the parking island that’s been deliberately designed to form a “protected” bike lane blocks my view of approaching traffic, thereby making my entrance harder. During my return to my hotel, traffic was much more congested. 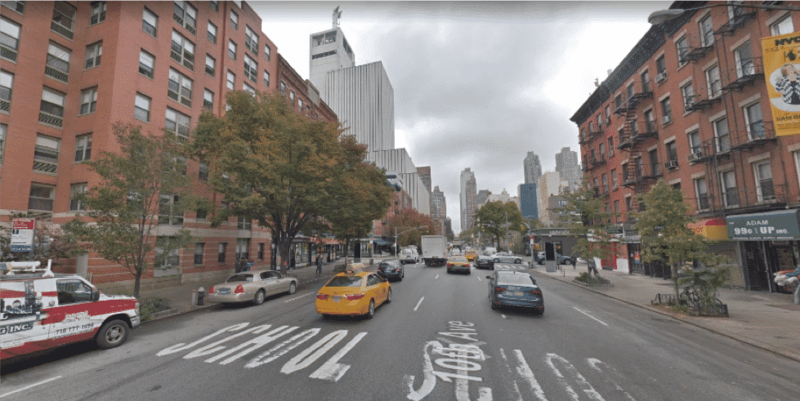 NYC’s big avenues have as many as six lanes going in the same direction, all of them being used. Naturally there are lots of cabs. It was during this ride back that I drew the ire of several of them. One yelled at me to go back where I came from. One called me some name that had the word “head” in it. Another turned off his engine at a red light so I could hear him telling me to get in the bike lane, whereupon I told him that I wasn’t going over there. I had zero problems with drivers when there was no bike lane on the road. Despite these somewhat heated exchanges in close quarters, at no time did I ever feel my life was in danger. Nobody ever made a move to run me off my bike. I was completely in control of my environment and it showed. It’s a sorry state of affairs that savvy cyclists face the greatest incivility on roads with bike infrastructure. We understand why it’s safer and easier to use regular travel lanes, but most motorists don’t. I had zero problems with drivers when there was no bike lane on the road. My behavior and tactics on the bike didn’t change one iota. I always held the lane, looked behind, signaled turns, stopped at stop lights, stopped for pedestrians. This was no problem for other drivers on the road with me until the moment a bike lane appeared. Then it was OMG!-GET-IN-THE-BIKE-LANE-YOU’RE-GONNA-GET-KILLED-GET-OUTTA-MY-WAY!!! Strange how that logic works. We both laughed and waved and went on our way. Adding this to my earlier experience, I thought that maybe New York drivers aren’t as bad as I’d been led to believe. 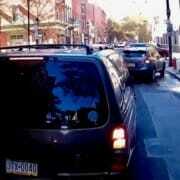 Why I felt justified not using bike lanes. New York cyclists, now they’re a different story. 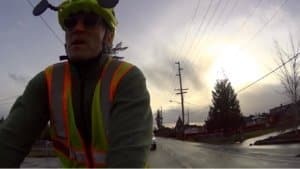 During my whole time there, both on and off the bike, I saw all manner of scofflaw behavior, from running red lights to brazenly riding up the bike lane the wrong way. Here’s why I felt justified not using bike lanes. As I mentioned earlier, no law obligates you to endanger yourself. NYC bike lane law has a loophole that says you must use a bike lane if it’s available, but not if you feel it’s unsafe for any reason. My position is that the bike lanes are NEVER safe, because you never know when you’re going to run into wrong-way cyclists. In separated bike lanes, my maneuvering margin was greatly reduced. Not to mention the possibility of coming into conflict with turning traffic at every intersection, both with regular bike lanes and “protected” ones. We get along much better with drivers, because we’re all following the same rules and we’re all watching out for one another. I told him I wasn’t worried and that the problem with the bike lane is that they’re full of bikers. I didn’t have time to add: Bikers who don’t follow the law. But right on cue, a cyclist in the bike lane sauntered right through a red light. Point made. I’m not advocating that you go to NYC and snub your nose at New York’s mandatory bike lane law. I’m certain a large portion of my success was due to the fact that I never crossed paths with New York’s Finest. If I had, I would have defended my point of view, well aware my efforts would likely have fallen on deaf ears. Nevertheless, I left New York solid in the knowledge that my CyclingSavvy skills can truly be used anywhere. And I do mean ANYWHERE! !